← Where is the Church? St Augustine is perhaps one of the most explicit Platonists in the Christian tradition. The first work he penned, Contra Academicos (Against the Academicians), relies heavily on Platonic arguments to refute the skepticism found in Cicero’s dialogue of the same theme, Academica. In fact, at the end of the dialogue, Augustine posits a “secret history” to explain how the Skeptical Academy was all along still committed to Platonism, but used skepticism as a tool to hide their true beliefs and purify potential initiates.1 It is no surprise that something like this transition occurred in Augustine’s own life. As he narrates in his Confessions, Augustine underwent a number of critical ‘conversions’: first to the naïve Manicheanism of his youth (Bks. I-IV), then to a skepticism that freed him from superstition, but failed to offer anything positive in return (Bk. V), from which he found solace in Platonist transcendence (Bk. VII), and only thereafter beheld Christianity as a consummative end to the journey, notably due to the incarnation (Bks. VIII-IX). Of course, there are numerous developmentalist scholars that read these conversions as hard breaks in Augustine’s intellectual and spiritual life, basically arguing that once he moved forward he never looked back.2 The story is rather quaint. 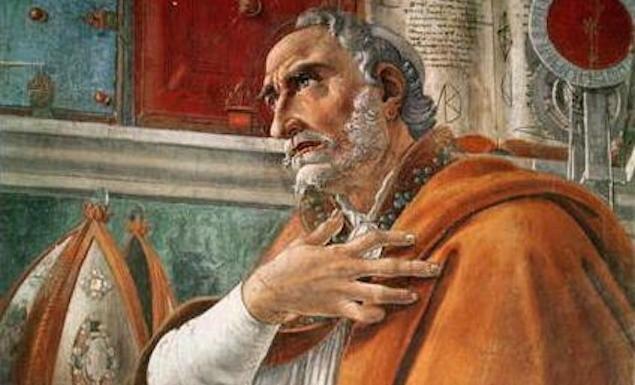 As it goes, at his intellectual height, Augustine was an optimistic Platonist who finally read some Paul and realized he needed grace, and so became the ardent defender of dogma we know and love. But this view lacks any and all nuance. It hardly makes sense of the end of the Confessions itself. His discussions of memory (Bk. X) and time (Bk. XI) are indisputably Platonic, and the capstone books divulge Neoplatonic (Bk. XII) and ecclesial (Bk. XIII) readings of Genesis, and provide no indication that these readings are developmental or conflicting. This view neither accords with the material we find even in what is regarded as his most ‘Christian’ works, such as De Doctrina Christiana (On Christian Teaching) or Civitas Dei (City of God), where the insights from his dialogical and Platonic days are still in full view, for example, in his distinction between temporal and eternal law from De Libero Arbitrio (On Free Choice of the Will). How, after all, does one make sense of his final days as he meditated on a portion Plotinus’s Ennead I.4?3 I am yet to see a plausible alternative. At any rate, I am not here to argue the specifics of Augustine’s commitment to Platonism. I merely use him as a litmus test for a kind of prevalent reading of the Fathers and the Church’s tradition in general. The narrative is simple: Christianity and Platonism are incompatible, the Fathers may have been enamored by Platonism for a time, or even formally trained in it, but eventually they abandon it for the Gospel, and their anti-Platonic rhetoric is proof. Let us be honest, the principles are insurmountable. Platonism offers us optimism about our rational and moral capacities to mystically ascend “alone to the alone,” that is, to the absolute simplicity of the One, of which we are all necessary emanations and to which we all must necessarily return.4 Christianity, on the other hand, offers us the grace of biblical revelation, which reveals God as a personal Tri-unity that creates ex nihilo in utter freedom and creativity, and even deigned to become incarnate in history, in flesh and blood, suffering death for our sakes. The two are so obviously irreconcilable. Augustine could not have thought otherwise, let alone anyone else; if they did, they were palpably wrong. Or so the rhetoric goes. On the contrary, one cannot separate Christianity from Hellenism any more than one can entirely separate Christianity from Judaism, and the Judaism from which Christianity emerges is already substantially Hellenized. In order to understand this point, we have to abandon strawman Platonism and answer the classical what is it question. Upon that investigation, we can begin to see how Platonism actually bolsters the Gospel, not hinders it, through the inheritance of a robust metaphysical vision of reality brought to perfection by the Church in Christ. In short, as Nicolás Gómez Dávila once remarked, “paganism is the other Old Testament of the Church.”5 A rejection of this view amounts to a vacuous notion of revelation, and so of God’s relation to the world. Before proceeding further, I need to make an almost obvious point, already intimated: the Christian tradition is infused with the Platonic, and any attempt to irrevocably disentangle the two inevitably leads to collapse. I do not intend to give a survey of that tradition, but I am not sure any other narrative quite makes sense of, say, St Justin Martyr, Clement of Alexandria, Origen of Alexandria, the Cappadocian Fathers, St Dionysius the Areopagite, St Thomas Aquinas, and so on. In short, the tradition is overwhelmingly sympathetic to Platonism, often uses it rather explicitly, and even in those more rhetorically dismissive moments, continues to draw from the fruits of Platonic speculation.6 Does that mean Christianity is reducible to Platonism? Of course not. But, as the epigraph attests, I aver that the Fathers saw Platonism as the closest system to Christianity, and Christianity as the natural inheritor and perfector of its metaphysics, to which Augustine’s conversion exemplifies. Let me, therefore, begin to provide a defense of Christian Platonism, hopefully to inspire those who are unfamiliar, and perhaps give detractors pause for further reflection. First, humor me with an anecdote: when I was first taking philosophy classes as an undergraduate, I was taught Plato by a rather analytic-minded German who was clearly enamored with Wittgenstein. It must be something of a penchant among that creed to not take Plato and his inheritors seriously, perhaps it is because they find him merely laughable, maybe dangerous. Who can say? I am no expert on the matter; I merely offer a consistency of experience. At any rate, the Plato I received from this fellow was wholly unimpressive. He gave us the standard narrative about the twin pillars of the Academy: immortal souls and forms, and tried to show how it was all glaringly gibberish, overflowing in logical error; you’re likely familiar with two-world theories and Aristotle’s third-man argument, that sort of stuff. Nonetheless, it is hard to engage Plato and walk away unchanged. Change the subject and emphasis of Heraclitus’s popular phrase—you cannot step twice in the same river—and you actually can have something prophetic and profound. It is not the river that cannot be stepped in twice, it is that one cannot engage Plato twice and come out unscathed. Plato is not liable to senescence, and he is not reducible to caricatures, no matter the prevalent delusions of impoverished narratives. Thus, despite this German’s emphatic dismissal, his view never persuaded me. My suspicions remained ever vigilant. How to refute that poor German, though? I did not know then, but I was certain we were not still reading Plato today because he was ultimately a dunce, even if a rather utilitarian dunce that instigated an impressive philosophical domino effect. But woe is me, persistent narratives can be vicious things, can’t they? By time I was in my junior year I was an obedient steward of the anti-Plato narrative—my resolve was clearly short-lived. I had read my N.T. Wright like any good budding Christian intellectual, and Wright had assured me in that little publication Surprised by Hope that Plato was to blame for a shallow Christian eschatology (the negation of an eschatology consisting of harps, clouds, and angel-fied grandmas is not too hard a sell).7 Therefore, if we wanted to save Christianity from its contemporary ills, we had to axe Plato. Except not long after that Wrightian rendezvous I met a rather eccentric and gregarious Augustinian—or rather a scholar of Augustine, as he would have it—who was keen to interpret Augustine Platonically, and was persuasive in arguing that such a reading was a more plausible account than what was on offer, and, more importantly, he showed how such a reading had real world implications, positive implications in fact, for pedagogy, for evangelism, and ultimately even for theology; that is a story for another time. My point is that after I had moved from Platonic interest, to dismissal, to renewal, I continued my quest to make sense of this enigmatic figure well into my graduate years. My question was almost always the same: what, pray tell, are the hell are these things called forms? That must be the key. Is that not what is at stake? Is that not the running joke? Plato wants to hang out with ethereal hexagons, and you can too? It was not until a little later into my graduate school moorings that I found my answer: to be is to be intelligible.8 And here we have the root of the matter. Hitherto then the quest was misguided. You cannot make sense of the forms within a metaphysics dominated by epistemology, or probably better to say a metaphysics of epistemology, and such is the prevailing tendency of Anglophone philosophy. We have to do our best to think with the ancients, to see things how they saw them, in hopes that we too might come to see things differently, maybe more clearly, or even perhaps as they really are. This view was one of the most enduring contributions of Pierre Hadot: we need to return to the roots of philosophy as coming to possess a certain vision of the world, instead of strip-mining it for arguments, and then trying to contort those arguments to fit our epistemological assumptions.9 As has been frequently professed by others, let our metaphysics influence our epistemology, not vice versa. In which case, how might this central metaphysical assumption change the way we see the cosmos? What does it mean to say being is intelligibility and intelligibility is being? Contrary to the ways of manual philosophy, we should not start at the top of the metaphysical hierarchy, we can only do that once we understand how we got there. We must start with ourselves, as the enduring dictum demands: know thyself. Thus, since soul qua rational is an actualized intellect, there must be something that is properly intellectual. It must be thought-thinking-itself, which is the same conclusion Aristotle arrives at with his Unmoved Mover. If that is so, this reality will not be an actualized intellect but simply be intellect. It can never admit falsity or non-thinking, otherwise we would have to push the causal question further until we discovered that which is truly intellect. In short, if we are to have any meaningful hope that we do in fact know things, there must be a reality which is already that union between thought and thinkable in its very being. Skepticism may be a reality for us, but it is not indicative of reality as such. Our reason may be divided, but the fact that we reason at all presumes we participate in a purely intellectual reality, otherwise all our reasoning’s are illusions. If we are to avoid nihilism, there must be some primordial union, or communion, between being and thought. Intelligibility is reality, nihilism is not. For a detailed treatment, see Erik Kenyon’s ‘Platonic Pedagogy in Augustine’s Dialogues’ in the journal Ancient Philosophy, pp. 151-168, volume 34 (2014). Kenyon also has a book on the same topic, Augustine and the Dialogue, recently released from Cambridge Press (April 2018). Peter Brown is perhaps the most popular developmentalist. See his Augustine: A Biography. Consider as an example someone like Gregory of Nyssa in his masterful work, On the Soul and the Resurrection, where in Chapter 3 he claims he’s turning away from “secular philosophy” and relying solely on Scripture, but then goes on to present a clearly Platonic reading of scripture scaffolded by Greek logic. N.T. Wright, Surprised by Hope, especially Part II. Eric Perl is the only scholar I know of that puts an unrelenting and explicit emphasis on this maxim. To see its implications in the thought of Dionysius, see his short book Theophany, but for a more sustained introduction to its use throughout the classical tradition, see his book Thinking Being: Introduction to Metaphysics in the Classical Tradition. Of course, Perl picks up its centrality from Plotinus himself, which he in turn gets from Parmenides (Fragment B3), which says that “thinking and being are the same thing” (V.1.8; V.9.5). Finally, you can find similar ways of thinking in some 20th c. Thomists, such as Jacque Maritain’s Approaches to God and Norris Clarke’s The One and Many. See Pierre Hadot’s Philosophy as a Way of Life for his general view. But I would highly recommend Plotinus: Or the Simplicity of Vision for an application to Plotinus, which I’ve personally found more edifying due to that same focused application. While these kinds of ‘ascents’ from soul to the One are all over Plotinus’s Enneads, the most systematic presentation can be found in Ennead V.1. Denys Turner has a helpful discussion on the difference between John Locke and Thomas Aquinas’s theories of abstraction in his work Thomas Aquinas: A Portrait. While he is discussing Thomas Aquinas, and not Platonism per se, I think the same distinction applies. For Locke, abstraction is a kind of ‘thinning out’ of the content, hence how we get the idea of the forms being lifeless and inert, stripped of their concreteness, so to speak. For Aquinas, on the other hand, abstraction is in fact the opposite. It provides more depth and meaning to otherwise ‘lifeless and inert’ matter. As Turner explains, it is the difference between thinking of a space filled with various pieces of matter, material and texture, having no governing or unifying principle, to seeing that same room as a living room, and all of the mental content that follows from that meaning: a place where you read, socialize, play games, etc. Alexander Earl currently teaches Theology and History at a college-preparatory school in Santa Monica, California. He holds a Masters of Religion in Philosophical Theology from Yale Divinity School. This entry was posted in Alexander Earl, Philosophical Theology and tagged Augustine, Christianity, Platonism, Platonist metaphysics. Bookmark the permalink. I’d like to welcome Alexander to Eclectic Orthodoxy and thank him for his first contribution to the blog. I look forward to more such articles. Thanks, Alex! Thank you, Alex, for this compelling case for Christian Platonism. Given my interest in early modern alchemy, I couldn’t help but chuckle at your apt assertion that the soul “… is not a foreign homunculus inhabiting a machine for a joy ride. It is the principle of life for a body.” Well put!